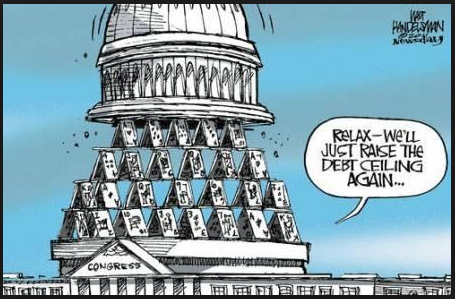 Congress has just postponed the debt ceiling until December 8 but at least they didn’t repeal it. It is crucial to retain regular and explicit debt ceilings as a reminder of the urgency of putting our debt on a downward course (as a percentage of GDP). The debt now stands at 77% of GDP (for the public part on which we pay interest), the highest it has been since right after WWII. The $15 trillion public debt right now is essentially “free” money because interest rates are so low. But interest rates will inevitably return to more normal, and higher, historical levels and, when this happens, interest payments on the debt will skyrocket. The entitlement programs of Social Security. Medicare and Medicaid are the drivers of our debt problem because their costs are increasing so rapidly. Medicaid costs the federal government almost $400 billion per year. Medicare costs the federal government $400 billion per year more than it receives in FICA taxes and premiums paid. The attached chart demonstrates the scope and urgency of the problem. 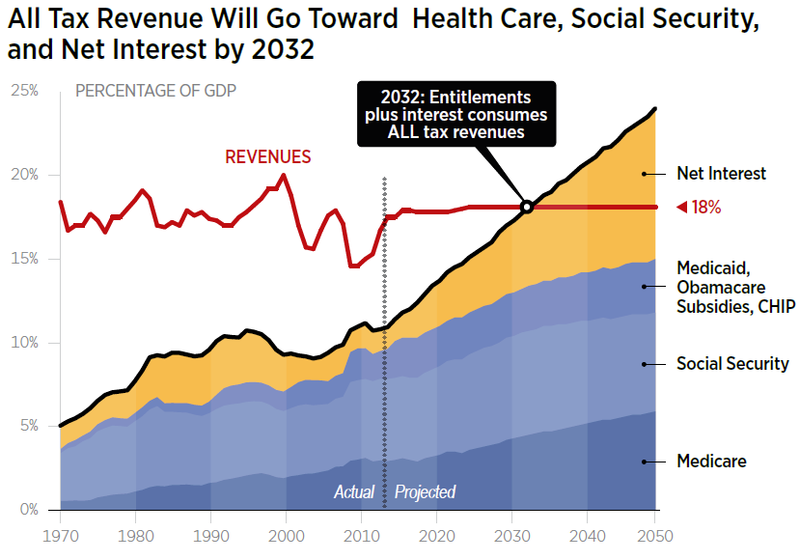 By 2032, just fifteen years from now, all federal tax revenues will be required to pay for Social Security, Medicare, Medicaid and interest payments on the debt. This means that all of ordinary discretionary spending: on defense, various government operations and social welfare programs will be paid for entirely from new deficit spending and, in the process, will almost inevitably suffer huge cutbacks. The lower-income and poor people, who are the most reliant on government programs to get by, will be the most adversely affected. Conclusion. Such a dreary scenario of drastically tightened government spending does not have to occur. It can be avoided by immediately starting to make sensible curtailments, not actual spending cuts, all along the line. Do our national leaders have the common sense and fortitude to do this?